I watch him grow and develop with a keen interest. It is only through each of my babies’ eyes as they explore their world that my eyes are opened to the little joys and pleasures that I take for granted everyday. With each new discovery he makes, my heart skips a beat as I learn to see the world through the eyes of a baby. Visit Mother May I to see more Best Shot Monday photos that make one’s heart skip a beat. That photo is amazing ! They sure do grow quickly !! wow, amazing. What a sweet little guy! oh, and the curled up toes! so beautiful. and so true…kids are a wonderful reminder of how amazing the "little things" are, huh? wonderful capture — his expression and the composition are great! Absolutely amazing picture! Love the toning! My heart skips a beat too! Beautiful photo of a cute little guy. so sweet! Those little toes! To die for! 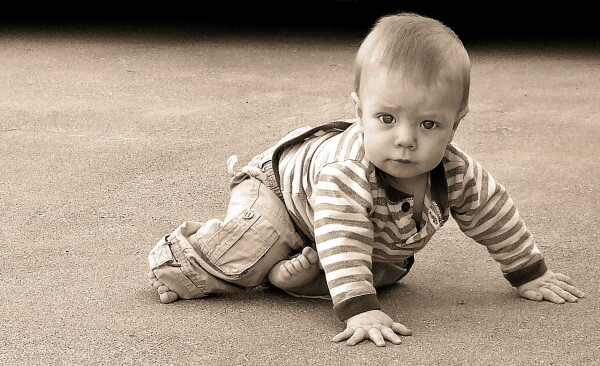 What an adorable baby… great photo! I agree – one of the best things about being a mom is seeing the world through their eyes. Thanks for sharing! Thank you everyone for your kind words! he is sooooo cute! great picture! What a beautiful image…and beautiful words. He is such a doll…I loe those little tooties peeking out!